10 A None No Power Seat 10 A is an Economy Class Exit Row seat with extra legroom. The tray table is in the armrest, making the armrest immovable and slightly reducing seat width. There is no floor storage for this seat during take-off or landing. 10 B None No Power Seat 10 B is an Economy Class Exit Row seat with extra legroom. The tray table is in the armrest, making the armrest immovable and slightly reducing seat width. There is no floor storage for this seat during take-off or landing. 10 C None No Power Seat 10 C is an Economy Class Exit Row seat with extra legroom. The tray table is in the armrest, making the armrest immovable and slightly reducing seat width. There is no floor storage for this seat during take-off or landing. 10 D None No Power Seat 10 D is an Economy Class Exit Row seat with extra legroom. The tray table is in the armrest, making the armrest immovable and slightly reducing seat width. There is no floor storage for this seat during take-off or landing. 10 E None No Power Seat 10 E is an Economy Class Exit Row seat with extra legroom. The tray table is in the armrest, making the armrest immovable and slightly reducing seat width. There is no floor storage for this seat during take-off or landing. 10 F None No Power Seat 10 F is an Economy Class Exit Row seat with extra legroom. The tray table is in the armrest, making the armrest immovable and slightly reducing seat width. There is no floor storage for this seat during take-off or landing. 25 A None No Power Seat 25 A is an Economy Class seat in the last row of the plane that is missing a window. This seat may not recline and the close proximity to the lavatories and galley may be bothersome. 25 F None No Power Seat 25 F is an Economy Class seat in the last row of the plane that is missing a window. This seat may not recline and the close proximity to the lavatories and galley may be bothersome. 8 A None No Power Seat 8 A is a standard Economy Class seat however, this seat has limited recline due to the Exit Row behind. 8 B None No Power Seat 8 B is a standard Economy Class seat however, this seat has limited recline due to the Exit Row behind. 8 C None No Power Seat 8 C is a standard Economy Class seat however, this seat has limited recline due to the Exit Row behind. 8 D None No Power Seat 8 D is a standard Economy Class seat however, this seat has limited recline due to the Exit Row behind. 8 E None No Power Seat 8 E is a standard Economy Class seat however, this seat has limited recline due to the Exit Row behind. 8 F None No Power Seat 8 F is a standard Economy Class seat however, this seat has limited recline due to the Exit Row behind. 9 A None No Power Seat 9 A is an Economy Class Exit Row seat with extra legroom that may have limited recline due to the Exit Row behind. The tray table is in the armrest, making the armrest immovable and slightly reducing seat width. There is no floor storage for this seat during take-off or landing. 9 B None No Power Seat 9 B is an Economy Class Exit Row seat with extra legroom that may have limited recline due to the Exit Row behind. The tray table is in the armrest, making the armrest immovable and slightly reducing seat width. There is no floor storage for this seat during take-off or landing. 9 C None No Power Seat 9 C is an Economy Class Exit Row seat with extra legroom that may have limited recline due to the Exit Row behind. The tray table is in the armrest, making the armrest immovable and slightly reducing seat width. There is no floor storage for this seat during take-off or landing. 9 D None No Power Seat 9 D is an Economy Class Exit Row seat with extra legroom that may have limited recline due to the Exit Row behind. The tray table is in the armrest, making the armrest immovable and slightly reducing seat width. There is no floor storage for this seat during take-off or landing. 9 E None No Power Seat 9 E is an Economy Class Exit Row seat with extra legroom that may have limited recline due to the Exit Row behind. The tray table is in the armrest, making the armrest immovable and slightly reducing seat width. There is no floor storage for this seat during take-off or landing. 9 F None No Power Seat 9 F is an Economy Class Exit Row seat with extra legroom that may have limited recline due to the Exit Row behind. The tray table is in the armrest, making the armrest immovable and slightly reducing seat width. There is no floor storage for this seat during take-off or landing. Germanwings flies the Airbus A319 in three versions. This version is similar to version 1 because it has 144 Economy seats, however this version has 2 Exit Rows. Some seats in the middle seats are left empty in Economy to provide additional space for those who booked "Best Seats"
Flew outbound in 9F (exit row) and returned in row 6. Decent legroom in both seats in "Smart" class. "Smart" is the best value for money part of the plane being only slightly more expensive than "Basic" but significantly cheaper than "Best". Your fellow passengers have also worked this out so it is likely to be the part of the plane with the highest occupancy. "Smart" comes with a free snack but beware this is an indifferent offering. You have to explicitly ask the Flight Attendant if you want food from the inflight menu or an alcoholic drink (not free). The tray tables in the exit row are in the back of the seat in front rather than the armrest as described in Seatguru. Seat 3F is classed as a 'Best Seat', and I have to say, it's one of the best seats I've ever experienced on an single aisle Airbus! Legroom was well worth the extra £10 or so, which also included a snack and a drink, and the position of the windows in the seat meant you had 2, one providing a view forwards outside of the aircraft, and the other looking back towards the engine and the wing. 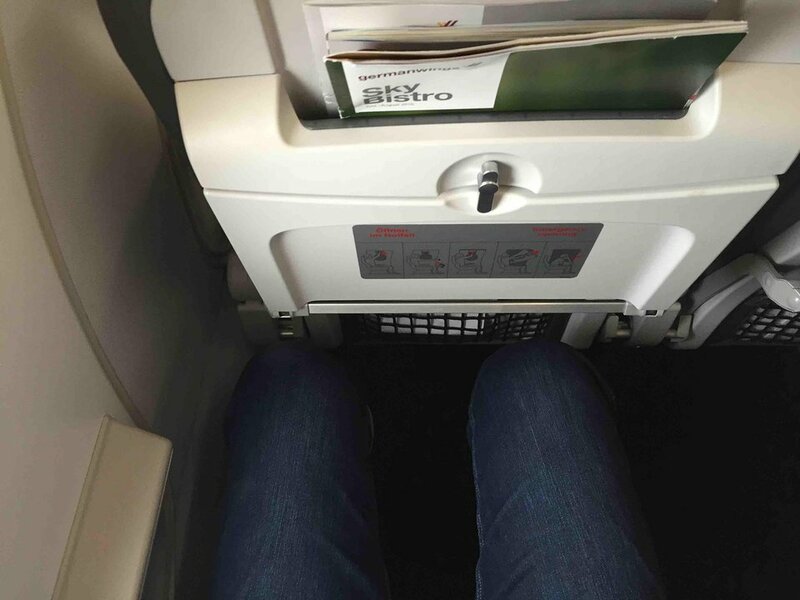 I would definalty recommend this seat to anyone flying with Germanwings in the future!